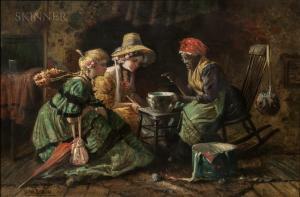 Find artworks, auction results, sale prices and pictures of Harry Herman Roseland at auctions worldwide. 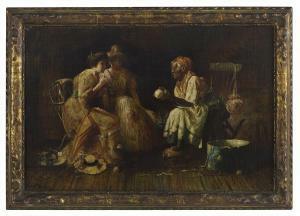 Harry Herman Roseland (American, 1866-1950) "Visit to the Tea Leaf Reader" oil on canvas signed lower left, an "Artists Framing Co., J. Lowenbein, Prop., Picture Frames, Fine Paintings, 57 East 59th Street, New York" label and handwritten inscription "This picture belongs to Mary E. Voorhees" en verso. Period frame. 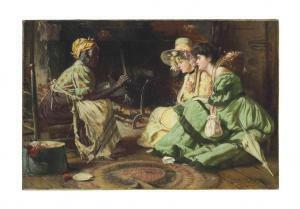 20" x 30", framed 24-1/4" x 34-1/4"
Description: Harry Herman Roseland (American, 1866-1950) The Magic Water Signed "Harry.Roseland" l.l., titled on an unattributed label affixed to the frame backing. Oil on canvas, 20 x 30 in. 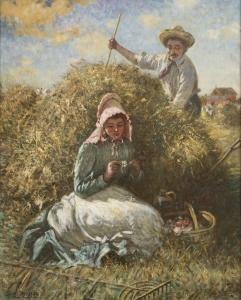 (50.5 x 76.0 cm), framed. Condition: Lined, retouch, craquelure. Provenance: Collection of Judge Jon Tom Staton, Edmond, Oklahoma. ''He Loves Me, He Loves Me Not'', a pining farmer's daughter, oil on canvas, 30'' H x 24'' W, est: signed lower left: Harry Roseland, signed again, titled and inscribed on a gum label affixed verso. Note: A copy of the Bill of Sale, Appraisal Report and Conservation Report accompanies the lot. Provenance: Private Collection, Whittier, CA. Condition: Visual: Generally good condition. Craquelure throughout. Blacklight: Small spots of touch-up scattered throughout, including in the man's and woman's faces.